The Connecticut League of History Organizations has selected the Fairfield Museum and History Center’s 2018 exhibition “Culper Ring: The Spies of George Washington” for a CLHO Award of Merit. The awards presentation will take place in April at the Mark Twain House and Museum in Hartford. 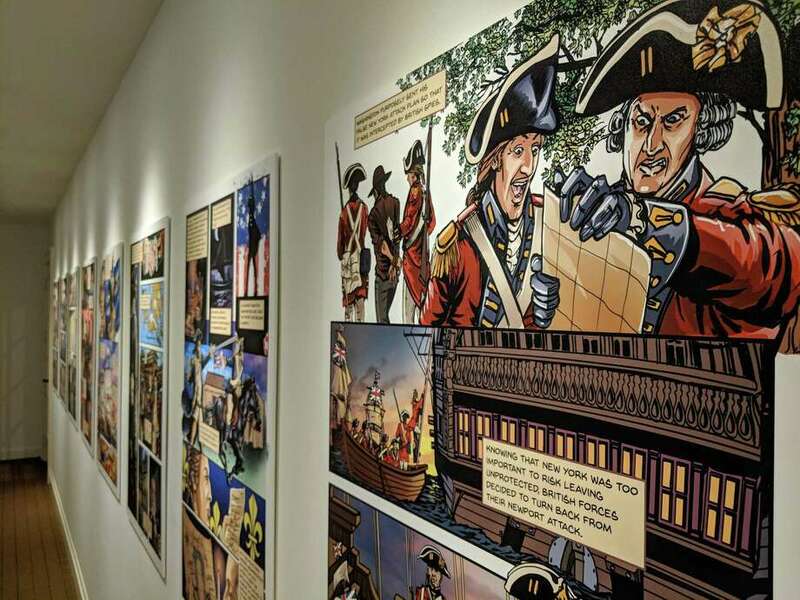 The recognized exhibition featured panels from a graphic novel with artwork by Kirk Manley that showed how spies played an essential role throughout the Revolutionary War in the local area. One of George Washington’s spies, Caleb Brewster, collected information brought across Long Island Sound, and would then meet with Benjamin Tallmadge in Fairfield. Tallmadge would carry his reports to Washington’s headquarters in Westchester County. Notre Dame High School-Fairfield will be hosting its Lancer Legacy Gala on March 16 at the Waterview in Monroe. This event is a celebration honoring Notre Dame’s 62-year history of helping students grow in character, faith and intellect. The evening will include cocktails, dinner and a silent auction, as well as the presentation of the Lancer Legacy Awards and Alumni and Athletic Hall of Fame inductions. The event is open to the public and all proceeds will benefit the students of Notre Dame. For tickets, sponsorship, donations and additional information, visit notredame.ejoinme.org/2019Gala or contact us at 203-372-6521. Notre Dame will also be hosting a fundraiser, raffling $15,000 tuition to the grand prize winner’s school of choice (kindergarten through college). The raffle is open to the public (any U.S. resident); schools must be accredited and located in the U.S.
Additionally, it can be used to pay back college loans. The scholarship can benefit up to two students of any age or grade. There are only 500 tickets available for sale at a cost of $100 per ticket. The prize will be transferred directly by Notre Dame to an institution designated by the winner. The winner may designate self, family or friends. Eligible expenses include tuition, room and board, books and school-related fees. The prize is not redeemable for cash. The winning ticket will be drawn on March 16, during the Legacy Gala. The winner need not be present to win. The town of Fairfield, in partnership with the Fairfield Chamber of Commerce, invites the public to attend the 2019 Fairfield Health and Fitness Expo on March 16 at the Fairfield University RecPlex from 11 a.m. ot 4 p.m.
“This year, the Fairfield Health and Fitness Expo will have something for the entire family to enjoy,” states Beverly Balaz, president of the Fairfield Chamber of Commerce. Free and open to the public, the expo will feature 70-plus exhibitors plus special activities for young and old alike. Food trucks will be available, serving a variety of tasty food items, and special drawings for prizes. A variety of demos available at the expo will include Dojo Fairfield: COBRA Self-Defense, an elliptical-based workout, kettlebells, KAATSU, yoga, Pilates and more. The annual St. Baldrick’s/Team Teddy-OHS event will be held, for the 10th year, at Osborn Hill School on March 15 at 5:30 p.m. Anyone interested in raising money by having their head shaved can sign up in advance by going to www.stbaldricks.org and typing in “Team Teddy — Osborn Hill School.” Or they can sign up on March 15 in person. Team Teddy was created to honor Teddy Gerber, who was in third grade at OHS when he was diagnosed with undifferentiated sarcoma, a rare and aggressive type of pediatric cancer. Teddy was recovering from two major surgeries in March 2010, but he was able to attend the event. He even acted as an honorary barber, shaving his dad’s, brother’s, and some friends’ heads. Less than six months later, he passed away at the age of 9. Team Teddy continues on in his memory, and to date has raised over $1,051,000. The St. Baldrick’s Foundation funds more childhood cancer research grants than any organization except the U.S. government.